I went into a bit of a cold sweat when the news car pulled up, but the crew ended up being some of my new favorite people. One of the most fun parts of being an author is traveling to cities where old friends live. I recently spent nine days in metro Atlanta, and while there were some challenging times (I’ll NEVER be ok with the traffic! ), there were some great times, too. Some major stuff went on with my book, but what truly helped my heart and mind was spending time with friends. Two of my friends were generous enough to open their house to me for the entire stay, which not only massively cut costs for me, but also provided a true sense of home-away-from-home. It was so awesome to come back to a home rather than an anonymous hotel room. I also got to spend time with a ton of college friends and one high school friend, and those moments are some that I’ll never forget. One of my closest friends had a serious talk with me about the future, careers, and general concerns of adulthood, and she gave me invaluable words that I didn’t even know I needed until I received them. Other friends bought me food, posted about my book on social media, connected me to PR-boosting opportunities, and showed me so much love and respect that at times I was almost overwhelmed. It’s humbling to see the care that some people take with their friends, and the time they’ll use in their lives to dedicate to someone else– and this time, that someone was me. I’m damn lucky and extremely grateful. Businesswise, I got a lot done. 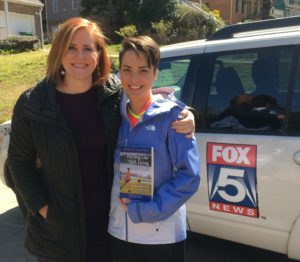 The biggest deal happened a few days into my trip, when a crew from Fox 5 Atlanta interviewed me about my book. I was so nervous, but they were wonderful people whose company I enjoyed so much that I was sad to see them leave. I have no idea what the finished segment will look like, but they made the filming process go very smoothly. Y’all know who you are, and I sincerely thank you for your general awesomeness. 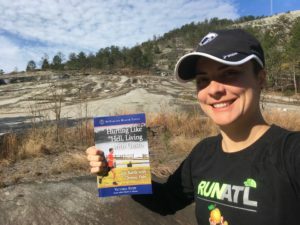 I took my book with me to hike at Stone Mountain Park, where so much of my life happened when I was younger. What an emotional rollercoaster to be back there with a book in hand! Another kind of big thing that went on– although it was big from an emotional standpoint more than a major business development– was teaching a class for one of my former professors. I spoke to creative writing students and remembered being in their seats not too terribly long ago, although it feels like a different life. It was heartbreaking, fun, weird, and great to be back on campus, but I guess that mix of emotions often happens when I visit places that once were a huge part of my daily life. I squeezed in a visit to a pair of chiropractors who specialize in helping people return to fully active lives, and their knowledge they gave me could easily be another chapter in my book. That’s one of the beautiful things about Atlanta, despite its traffic and sprawl– there are some really talented people living up there, and you never know who might help change your life for the better. 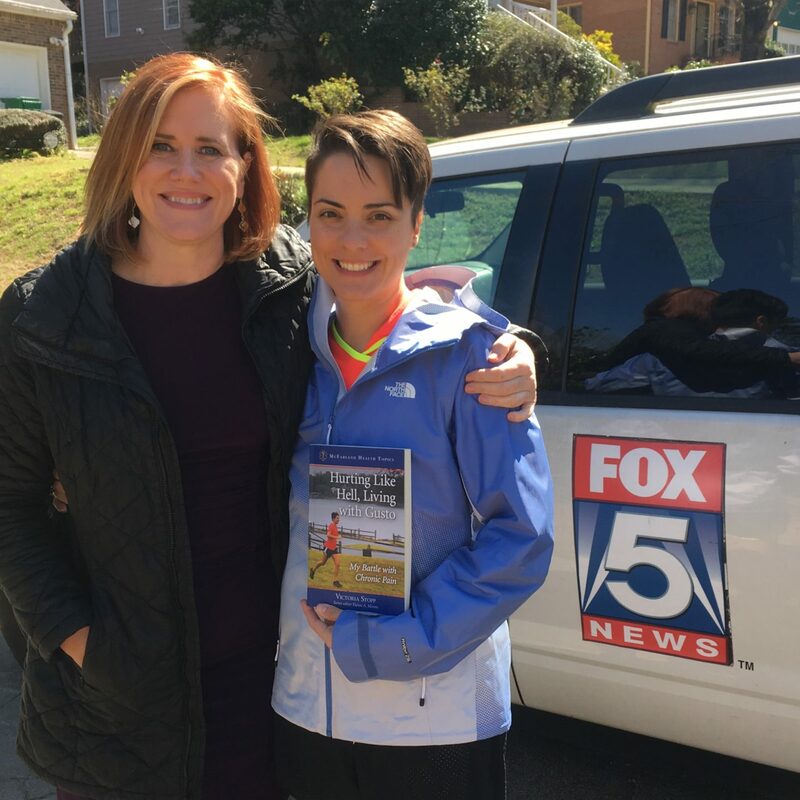 The Fox 5 interview will air three times tomorrow, twice in the morning and once in the evening. 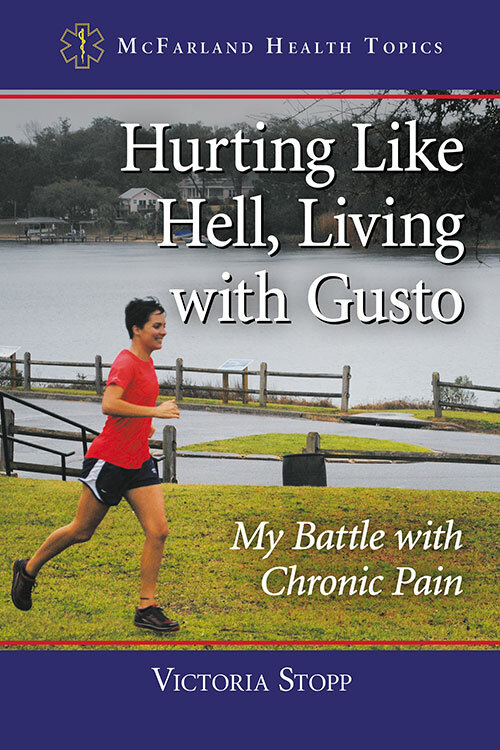 I have no clue what it will mean for my book and me– increased sales, new contacts, or nothing at all. I have high hopes, but no matter what, the trip to Atlanta was a great experience and not one I’ll ever forget.